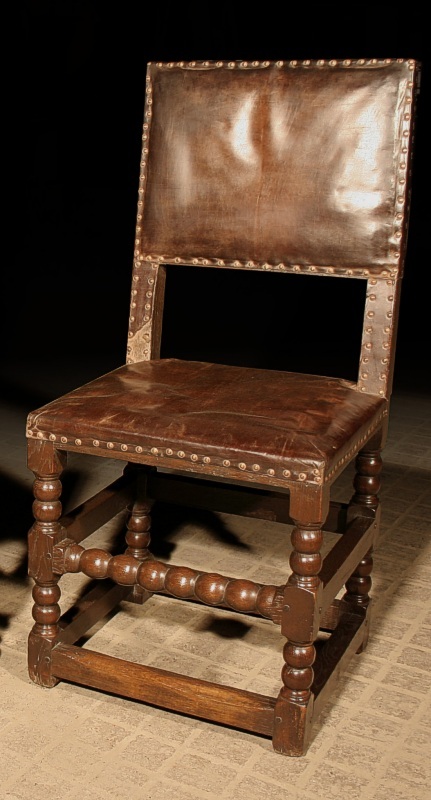 One of a set of six 17th Century Style Leather Upholstered Dining Chairs, handmade (click this link to appreciate what goes into our handmade furniture) from old reclaimed oak. Modelled on a c.1680 example, featured in Victor Chinnery's book "Oak Furniture, The British Tradition", the author points out the rarerity of any sort of turnings to the rear legs of English chairs. As bespoke chairs, the seat height etc. were carefully worked out with our client to provide the most comfortable seating position. With grateful thanks to Nick Humphrey (Curator - Furniture, Textiles and Fashion Dept., Victoria & Albert Museum, London SW7 2RL), for his invaluable assistance during research for this project. Price Guide: Top of C, handmade in old reclaimed oak, and upholstered in aged leather, including handmade upholstery nails (each chair). Upper half C, as above but excluding handmade upholstery nails (each chair).